-When a big bear man reminds you to put sunscreen on because "you white people have to be careful," you listen. Although he should've been there three hours later when I forgot to reapply. 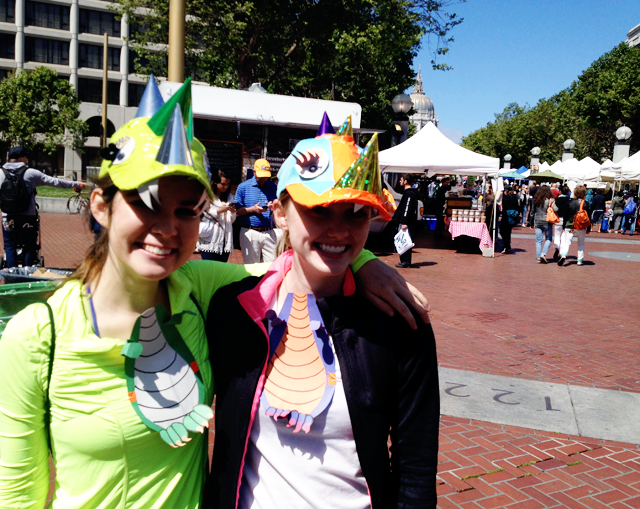 -Dinosaur hats are not only fun but fun-ctional. My face was the only thing that did not turn very red and stingy by the end of the day. -If your sister buys you blow-up dinosaurs, keep them always. 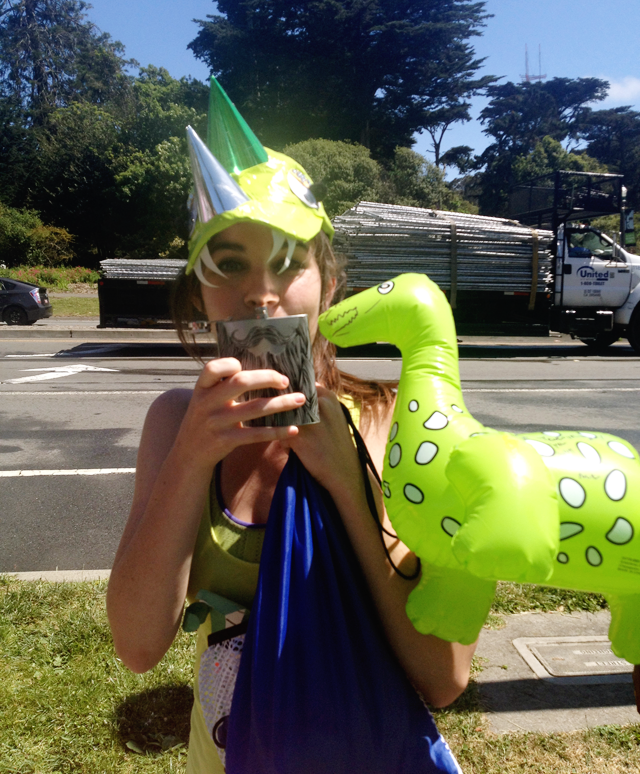 They will come in very handy when you decide to go with a prehistoric theme for a ridiculous outdoor party race. -Fireball whiskey tastes terrible when added to a mimosa, but it tastes pretty delish coming from a bearded flask. -SF popos don't like open containers. I didn't know normal laws applied in this city. Good to know. Also good to have a champagne-spiked orange juice bottle with a cap. 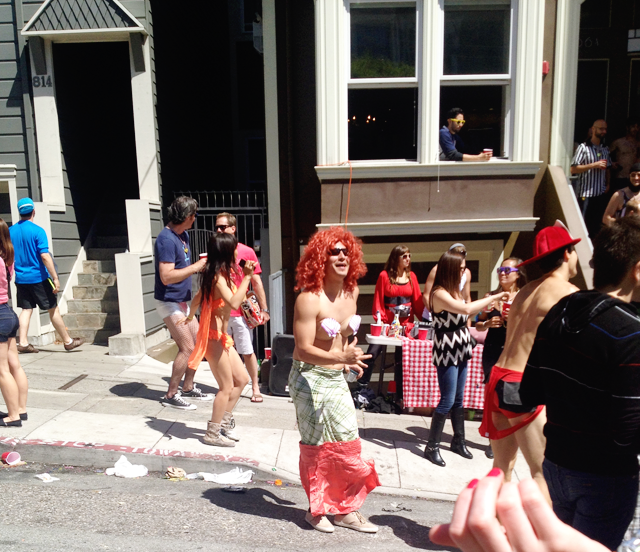 -Only the most out of shape and least endowed gentlemen like to do Bay to Breakers naked. Unfortunate, really. -I like the Little Mermaid much better as a muscular man. -Shaking a mimosa-filled container is not an effective way of mixing unless you like delicious volcanoes. -The more mimosas I drink, the less likely I am to whip out my phone and document epic costumes. -Hand crafting dinosaur costumes is a lot more work than it would seem. -Golden Gate Park is a great place for afternoon gymnastics. -I'm not as strong as my alcohol-influenced self might think (I might've dropped someone mid piggy back ride). -An English term for "put sunscreen on" is "let's cream you up" which I found to be very hilarious. Man, I love this city. Mimosas, fireball whiskey, and getting creamed up? Sounds like my kinda weekend. Sign me up for the next one! Lol. can i PLEASE do this with you next year? !